Our hat’s off to the competition… seriously! Their machine? Not so much. That’s why we’re not afraid to point them out to you or to link to their websites. Even though we have a better colloidal silver generator than theirs, we do respect most of the information they provide. We think you may find it useful. 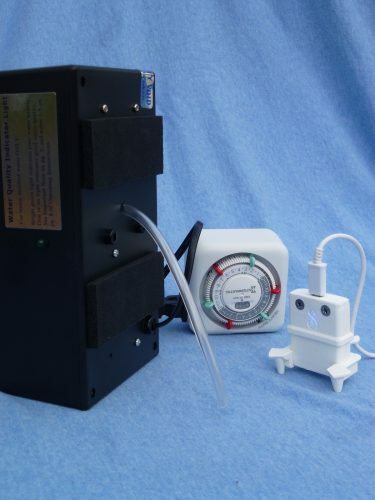 Our colloidal silver generator is worth more. We also believe that our offering is worth considerably more than theirs because of its advanced design concepts and engineering superiority. We invite you to compare our SILVERengines proton with their “Micro-Particle Colloidal Silver Generator.” We expect that you will agree that there is really no comparison! Their timer alone is bigger than our entire system! In fact, and we think you’ll agree, the proton versus the Silver Edge’s “Micro Particle Colloidal Silver Generator” is a real modern David and Goliath story! When it comes to “hitting the road,” the SILVERengines proton is the clear winner in the portability department! The proton is ultimately portable, all of its components fitting cleanly inside its own 16oz mason jar. 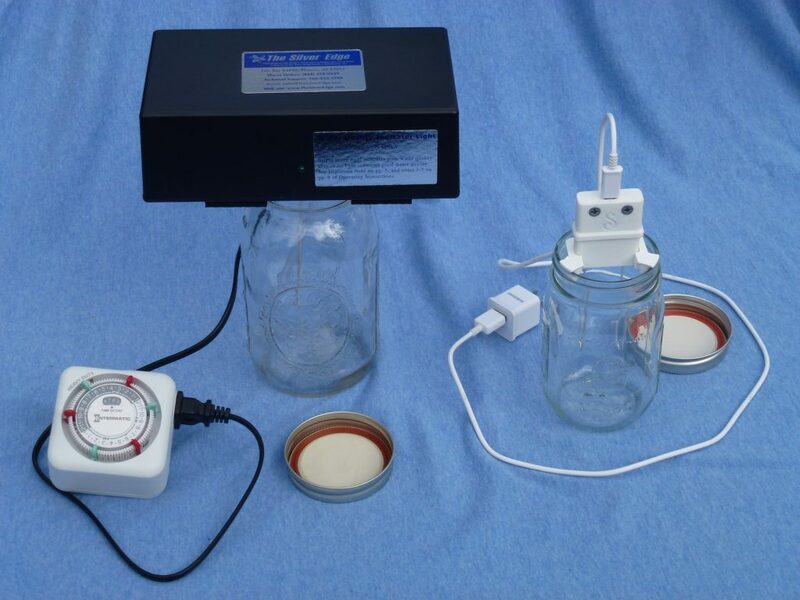 You can just tuck the proton, along with a few paper coffee filters and a couple of paper towels right into its very own solution processing mason jar. While there may be many nano-silver generator sellers in today’s market, there is one that we consider “the one to beat,” namely The Silver Edge. We consider Steve Barwick and the folks at The Silver Edge to be bona-fide marketing geniuses. Their research into colloidal silver is outstanding. They have a regular newsletter and they provide lots of background information about the benefits and uses of CS. Look over the chart on the left. 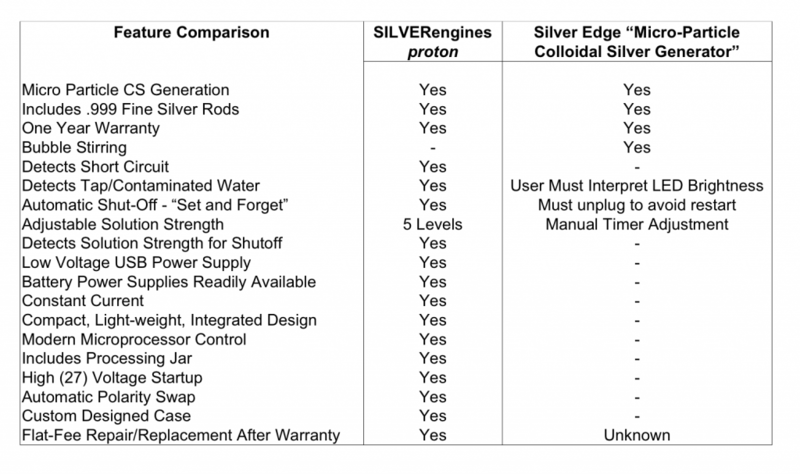 It’s easy to see that in spite of its diminutive size, the SILVERengines proton colloidal silver generator stands head and shoulders above the competition. Where theirs is noisy in operation, the proton is completely silent. With theirs you have to guess about water quality. The proton tells you positively if the water is bad. Their machine looks like a refugee from Radio Shack. The proton is a modern, compact, custom design.